Sometimes you and your family members just need a place to get away from it all. It’s easy to get caught up in everyday life. You get busy with work and it’s hard to stay in touch with everyone in your family all the time. That’s why we think everyone needs to spend time in the mountains with their family at least for a weekend! Our large group cabin rentals in Gatlinburg are perfect for creating new memories with your family members and that’s just one reason you should book a stay with Hemlock Hills Resort Rentals for your family reunion. All of our cabins come with really great amenities! You can challenge your family to a game of pool or soak in one of our bubbling hot tubs. You can also cook a meal together in one of our fully equipped kitchens. The best part is you don’t even have to leave the comfort of your cabin! You can even pop in a DVD for a fun movie night in. No matter what you decide to do, you’ll be having fun with your family. At Hemlock Hills Resort Rentals, we know our guests love to save money. That’s why we offer affordable cabins with amazing amenities. When you book one of our large group cabin rentals in Gatlinburg you’re actually saving money because you split the total price with your family. It’s a great way to have a fun vacation for the best possible price! 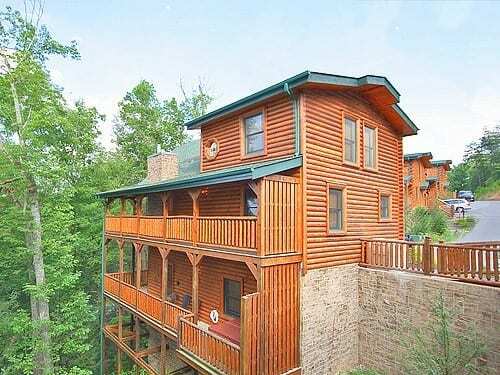 Browse our Gatlinburg cabin specials to see how we can save you money on your next stay with us. You can spend quality time with your family when you stay at one of our amazing cabins! You’ll get to catch up with them and see what they’ve been up to. It doesn’t matter what you decide to do together, they’ll have fun knowing you took the time to plan this special getaway just for them. Everyone will love sitting on the porch and relaxing at our cabins. You’ll get to recharge before going back to work, and you’ll go back feeling better than ever! Whether you’re taking in the mountain views or soaking in the hot tub, you’ll get the relaxing experience you deserve. Everyone needs a break every once in awhile, and staying in a cabin is the perfect place to enjoy the mountains. Your family will love getting to create new memories with you at the cabin. You can spend time with those you care about the most, enjoying a great vacation that everyone will cherish for years to come. Don’t forget to bring a camera so you can capture all the beautiful moments you have together! Are you ready to book your stay with Hemlock Hills Resort Rentals? Browse our large group cabin rentals in Gatlinburg to find the best option for your family reunion in the Smokies!